Education Master of Science in Physical Therapy in 2009, University of Connecticut Bachelor of Science in Physical Therapy in 2008, University of Connecticut Certifications Certified Orthopedic Manual Therapist (COMT) Titleist Performance Institute Certified Golf Instructor (TPI CGFI) Certified Myofascial Trigger Point Therapist (CMTPT) Graston Technique® Certified Strength and Conditioning Specialist Functional Movement Screening (FMS) Certified FRC Mobility Specialist Clinical Specialities Orthopedic manual therapy, sports medicine, mobility, myofascial release, and strength & conditioning. Outside of the clinic… Brian loves to support local events and causes, one of which being Alex’s Lemonade Stand. He also enjoys traveling, working out and playing golf. 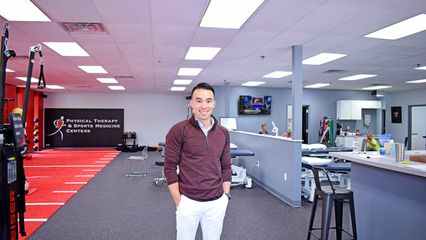 Education Doctor of Physical Therapy in 2015, University of Hartford Bachelor of Science in Physical Therapy in 2012, University of Hartford Certifications Certified Myofascial Trigger Point Therapist (CMTPT) Instrument Assisted Soft Tissue Mobilization (IASTM) Clinical Interests Orthopedics, sports-related injuries, and manual therapy for overhead athletes. Outside of the clinic… Meaghan loves to work out and spend some of her free time at the gym. She also enjoys watching sports, specifically football and hockey. Education Master of Science in Physical Therapy in 2008, University of Connecticut Bachelor of Science in Physical Therapy in 2007, University of Connecticut Bachelor of Science in Diagnostic Genetic Sciences in 2002, University of Connecticut Certifications Certified Myofascial Trigger Point Therapist (CMTPT) Titleist Performance Institute Certified Golf Instructor (TPI CGFI) Graston Technique® Clinical Specialties Orthopedics, myofascial release techniques, golf rehabilitation, and biomechanical foot assessment and orthotic management. Outside of the clinic… Jason loves to spend time with his family, exercise, and play golf! Education Doctorate of Physical Therapy in 2016, Springfield College Training & Certifications McKenzie A + B American Physical Therapy Association (APTA) Clinical Instructor Clinical Interests Michael focuses on knees and shoulders, specifically helping people so they can get back to their normal selves and doing what they love. Outside of the clinic… Michael is a huge Boston sports fan, especially the Red Sox & Patriots. He can typically be found outdoors, whether he’s hiking or training for his 100+ mile cycling race in September. Even though he’s deathly afraid of heights, he went sky-diving in June as he’s a big believer in trying everything once, especially if it’s outside of your comfort zone.